It was almost three years ago to the day (October 9, 2012) that teenagers Malala Yousafzai, Shazia Ramzan and Kainat Riaz were shot by the Taliban while they sat in their school bus in the Swat Valley. Those men targeted Malala because she was, already, at her young age, an outspoken champion of girls’ rights to study and attend school in Pakistan, in spite of an increasing extremist drumbeat of violence and intimidation to drive home their point of view that any woman’s place is in the home and only in the home. Malala began to find her voice for this issue when she agreed, at age 11, to become an anonymous blogger for the BBC Urdu service, chronicling her day-to-day life and the challenges of living normally after the Taliban came to town. Anyone with even a cursory interest in world news couldn’t help but know what came after that: the airlift to England for surgery to save Malala’s life, the rehab process after, and then the supersonic evolution into global advocate for girls’ education and media darling, culminating in her being the youngest recipient of the Nobel Prize. 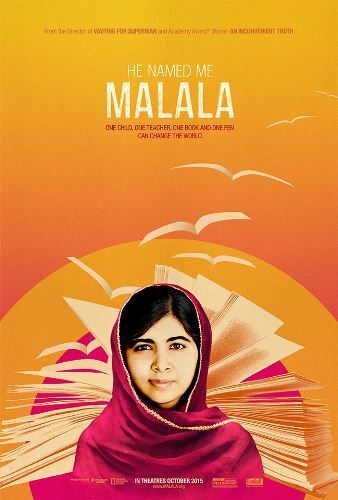 Davis Guggenheim’s He Named Me Malala tells the story of this young and already accomplished woman using a mix of his own footage from time spent with the Yousafzai family on the road and at their home in Birmingham, England, together with clips from the many, many hours of news coverage of Malala’s last few years. Into this Guggenheim also adds gorgeous animated artwork to tell the story of Malala’s childhood and explore her father, Ziauddin’s background. The animated sequences, designed by Jason Carpenter, are beautiful enough to stand as paintings. I wish these were carried over into a children’s picture book of Malala’s story. That would be a very delightful book indeed. In those scenes, we see Ziauddin as a young man, fighting to overcome a stammer and become as good a public speaker as his father. At first, when he speaks, the words come out of his mouth like heavy blots of black ink that fall to the ground, leaving a stain. As he gains control of the stutter and finds his voice, the inkblots change to smooth flowing streams. Later, Ziauddin opens a small school, where he was not just the teacher, but also the handyman if something broke. One particularly memorable image is an illustration of Ziauddin outside, seen through frame of the hallway and window of the school, clambering up a pole on the street and tinkering with some electrical wiring until the lights come on in the school. In the evenings, after classes were finished, Malala recounts how she would go into a room and pretend to be a teacher and all the students would listen to her. Guggenheim takes us along with Malala and her father as they zigzag from the UK to appearances at the Daily Show and the UN in New York, a Syrian refugee camp in Jordan, a visit to the parents of the Nigerian girls kidnapped by Boko Haram, and a girls’ school in rural Kenya. At one point, as she attends yet another event in the US, she stands – somewhat startled – alongside Christiane Amanpour facing dozens of photographers all shouting her name to get her to look in their direction. She says, almost plaintively, to Amanpour “I don’t know which way to look!” (Malala’s hearing in one ear was affected by the bullet wound to her head). Then there are scenes at home, with the usual joshing between siblings (Malala has two younger brothers), reverse mentoring as Malala showing her father how to tweet, and lamenting the negative impact all this global traveling is having on her grade point average at school. Unlike teens who’ve lived their entire lives in fast-paced urban settings, and often seem prematurely jaded and older than their years, when Malala is at home with family or her girlfriends, she still has the unaffected, at times shy, demeanor of a girl several years younger. Malala’s mother, Toor Pekai, leaves a strong impression, though she hardly speaks on camera. At age five, her father allowed her to go to school, but as the only girl in a class full of boys, she felt intimidated and left after one day, selling her books for some sweets. When she went to play with her little girlfriends instead of returning to school, no one in her family shepherded her back to class. That was where her formal education ended. Seeing her in Birmingham, far from home and extended family, you feel for her silences and all what they contain. In addition to Malala, I hope Toor Pekai gets to continue her education. Maybe when all three children are grown and out of high school, she’ll have a chance to do that. This is an inspiring, moving film, not just for the story of Malala and her family, but also for the director’s portrayal of the great love of learning and how dearly so many children in developing countries value having a school to go to. My friend and I came away from the screening wishing this film could be mandatory viewing in all NYC schools, to give kids here a chance to see how something they take for granted every day is quite precious in other parts of the world. And then I spotted this on the film’s website. In days where the news is full of refugees suffering and students being mowed down at a school in Oregon, it’s heartening to witness the resilience and good will of a very bright young woman, unbowed by the recent past and fighting for something she believes in. The film opens today in Los Angeles and New York, and next Friday, October 9th, it will reach many more cities. You can find the dates and locations here. Your article is not only faulactly incorrect, it is hugely mis-leading and almost an insult to the courgae and bravery of this young girl.It is almost as if you were specifically paid to stress upon the reader that the Pakistani Taliban and it’s attrocities are in no manner a doing or a consequence of the American and British policies in the region. Sadly, that is precisely the case. Here is a history lesson for you. The history you may not have learned from AP and Reuters but the history that actually happened on he ground.Pakistan was a remarkably moderate secular country up until the time of Gen Mohammad Zia ul Haq, a military dictator who came to power with the help of CIA in an illegal coupe against the hugely popular and elected government of prime minister Zulfiqar Ali Bhutto, whom, he promptly imprisioned and then hanged to death!Why? What had the CIA to gain? Two things:1. Firstly, Bhutto was the only leader in the history of Pakistan who enjoyed such enormous public support that it was impossible to maipulate him. On top of that, he was clearly left-leaning and was building close friendly ties with China and Russia.2. With the arrival of Soviet forces into Afghanistan the US urgently needed a base of operations and a few thousad illeterate idiots to wage a gurella war agaist the Soviet forces.Thus, radical Islam was implanted into Pakistani society by Gen. Zia under guidance of the CIA PsyOps agents. Dozens of training camps were established where thousands of ill-educated and radicalised young guerillas were tranied and sent into Afghanistan. The US and western media named them Mujahideens at the time and they were the darlings of the west regardless of the fact that they adhered to precisely the same beliefs as today’s Taliban.After the Soviet forces withdrew from Afghanistan, those guerilla fighters who were now highly experienced in Asymetric warfare were used by CIA all over the world. That was the time and the place, where the US and CIA learned how to radicalize innocent people and how to manipulate them to fight in the name of Islam. That is what is going on to this day and what we recently witnessed in Egypt, Libya, Tunisia and now Syria.Today’s Taliban in Afghanistan and/or in Pakistan is directly grown out of those elder guerella leaders and their clans, only now the chickens are comming home to roost.I could go on all night but unfortunately my time is limited.Read and follow John Pilger to get some practice in investigative journalism.Kind regards!